Langley Gates have years of experience in installing secure, safe and convenient automatic gates for both residential and commercial applications. Automated Gates pose a small but significant risk. Using the latest motor, installation & diagnosis technology Langley install and retrofit the safest possible gates. Langley have vast experience in building and installing commercial gates, both manual and automatic. with additional design stage considerations, Langley can be considered the the UK's premier commercial gate installers. With an unparalleled synergy between design and build, the Langley team can create bespoke ironwork projects as vast as your imagination. Situated in Derbyshire, we design, manufacture and install individual gates to customers requirements. Every gate is hand crafted by our skilled blacksmiths, then galvanised and painted or powdercoated to the highest standards. Whether you require a gate for your driveway, garden, entrance, estate or park we can accomodate your needs. Our gates can have electronic controls fitted to enable automatic or keypad access, giving added security along with the ease of electric operation. Although the design and manufacture of gates is our main business, we also produce railings, fences, security bars and grills. We also specialise in gate repairs and restoration - anything from a simple side gates to full double door driveway gates. Please browse through our wrought iron gates gallery, showcasing recent work undertaken for clients. If you need any assistance don't hesitate to contact us either by phone or e-mail. We offer free on site quotes and are always willing to discuss clients individual requirements no matter how unique. All images copyright © Langley Gates . All rights reserved. 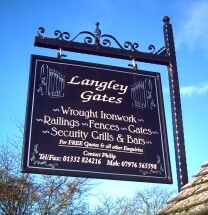 Langley Gates, Kirk Langley, Derbyshire - Electric Gates, Wrought Iron Gates, Metal Gates, Wooden Gates UK. CAME Blu-partners, wood gates, field gates, metal gates, railings. Graphic Design Gate Automation UK, Automatic Gates Installation East Midlands, Timber Gate Fitters and Wrought iron Gate Manufacturers, Gate Restoration, garage doors, electric gates, automatic gates, entrance systems, Wrought iron gate fabrication UK.